This Morning was initially conceived as a British take on the kind of US daily lifestyle shows of the 1980s. ITV invited four regional broadcasters to make a pilot, with Granada winning the final contract. 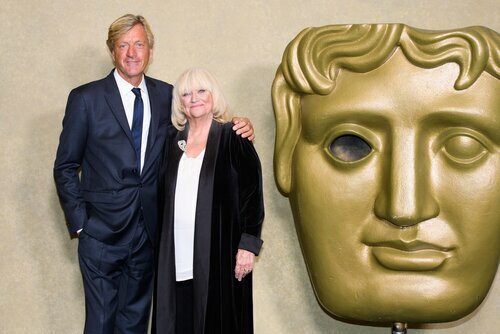 It engaged local husband and wife reporters Richard Madeley and Judy Finnigan (pictured here arriving at the BAFTA Tribute event) as presenters. As well as having experience with live television and journalistic backgrounds, Richard and Judy were warm, friendly, relatable and engendered trust. This Morning’s jaunty mix of showbusiness interviews and lifestyle tips, interspersed with topical news stories and astute items on often controversial issues proved to be inspired. Thirty years on and it has become a flagship show for the ITV network and an icon of British television. 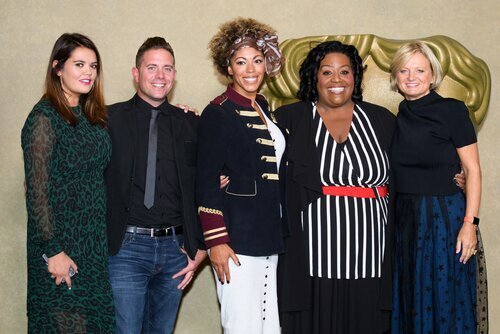 Many of its regular guests and experts attended the BAFTA event, including presenters (from left to right) Bryony Blake (make-up), Steve Wilson (technology), Dr Zoe Williams (health), Alison Hammond (celebrity) and Alice Beer (consumer rights). 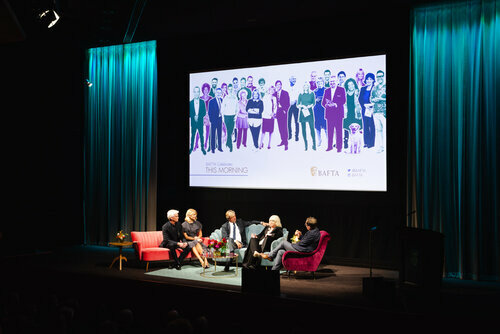 Current presenters Phillip Schofield and Holly Willoughby joined Richard and Judy on the BAFTA 195 Piccadilly stage for a celebratory Q&A with BAFTA-winning event host Alan Carr. Presenters, studios and behind-the-scenes personnel may have changed over the past 30 years, but the format of This Morning, with its wide mix of features, is not so different from the show that debuted on 3 October 1988, broadcast live from Liverpool’s historic Albert Dock. That first episode featured an interview with actor Paul Nicholas; a discussion about the MMR vaccine; a segment on knickers; and a public phone-in about working mums. Nothing quite entertains as much as seeing the hosts burst into a fit of giggles live on television, and all of This Morning’s presenters have been guilty of uncontrollably laughing at some point in the show’s run. There have been many instances over the years, from dunking a bit of beef to sausage in the hole, dog’s lipstick, chef Gino D’Acampo cooking naked and a performance by the Chippendales, to name a few. It’s part of the series’ charm. Equally, This Morning has never shied away from sensitively tackling such difficult subjects as suicide, terminal illness, violence and addiction. One particularly moving moment came when a woman phoned in to confide that she was trapped in an abusive relationship, quite literally as her husband had locked her in the house. In an overwhelming show of compassion, the public flooded the programme’s phone lines with calls offering to help. Breaking daytime television taboos has been a fixture of This Morning since the beginning. The show broadcast the first ever live breast, testicular and prostate examinations, pioneering moments that have literally saved hundreds of lives. Pictured here is Dr Chris Steele MBE, the show’s original medic (and Richard and Judy’s own family GP), who performed many of these groundbreaking television moments. Next to him is one of the show’s current medical experts, Dr Ranj Singh – his segment on ‘What to do when a child is choking’, posted online in January 2018, has been viewed almost 14 million times, showing that This Morning is still saving lives. 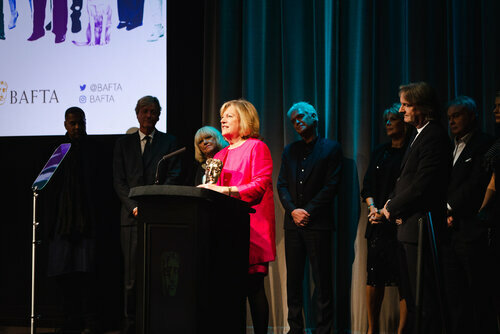 Daytime television legend (and former BAFTA Television Committee chair) Dianne Nelmes joined the presenters on stage for the presentation of the Special Award. Not only was Nelmes the launch editor of This Morning, she was the creative force behind Loose Women, The Jeremy Kyle Show and 60 Minute Makeover on the ITV network, helping to transform daytime television in the process. She eventually left ITV in 2008 after 25 years’ service. To her right is This Morning’s current editor Martin Frizzell. The many influencers of This Morning in one place. From left to right, standing: Emma Gormley (managing director of ITV Studios Daytime and current executive producer of This Morning); Martin Frizzell (This Morning’s current editor); Dianne Nelmes (former ITV Productions director of daytime and lifestyle programming, who launched This Morning as its editor); Phillip Schofield (current presenter), with the Special Award; Richard Madeley (former presenter); and Sue Walton (commercial executive at ITV Studios Daytime). Seated: Holly Willoughby (current presenter); Judy Finnigan (former presenter); and Ruth Langsford (current presenter). 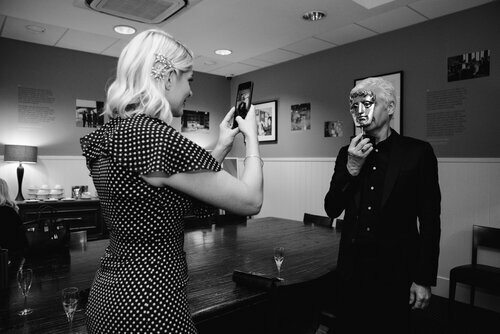 Holly Willoughby and Phillip Schofield take the obligatory BAFTA-trophy-in-front-of-face photo. The dynamic between Holly and Phil has been electrifying ever since she first joined him as co-host in 2009 (Schofield started in 2002). Their first year together on the couch saw a 20 per cent ratings bump, and even in today’s hugely competitive market, This Morning pulls in more than a million viewers every day. It’s social media presence is also huge – 2.1 million followers on Facebook, 2 million on Twitter, a million on Instagram and YouTube, while hosts Holly and Phil have 7.34 million and 4.45 million followers respectively. 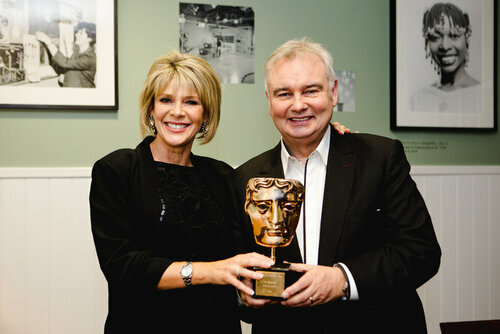 Friday hosts and husband and wife team Ruth Langsford and Eamonn Holmes OBE pose with the Special Award at the event’s reception. Already a This Morning regular, Langsford was joined by Holmes on the This Morning sofa in 2006, and the pair have been ever-present since. Interestingly, Holmes had been host of rival BBC daytime show, Open Air, when This Morning first launched in 1988. 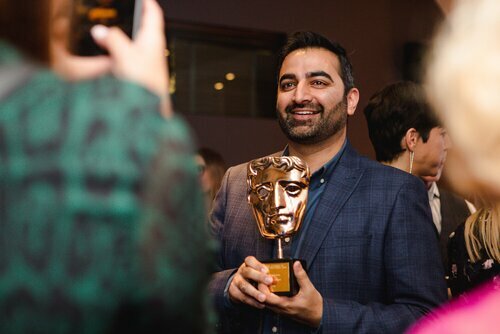 This Morning’s deputy editor Vivek Sharma gets his hands on the trophy at the reception. Sharma is one of many who have helped make This Morning a national institution. It has informed us. It has moved us. It has shocked us. It has entertained us. The talent, innovation and boldness of the whole team, spanning 30 years, has made it an influential contributor to British culture. And, as it steps into its fourth decade on air, This Morning will continue to deliver groundbreaking content, exclusive interviews, moments of unmissable television and, no doubt, a few giggles, too. Watch the full event and presentation of the Special Award here.